EPROM programmers already existed since more than 10 years, but in the late 1980's many new programmable devices came out, among them the popular GAL series from Lattice. The demand of a new low-cost device programmer arised. 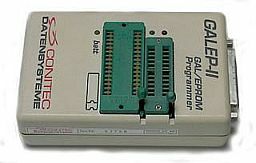 GALEP-1 was not a really universal programmer, but it supported all GAL and EPROM types (hence, GAL-EP) that existed in 1990. And it worked from a PC's printer port - most programmers of that time required a PC slot card. Due to its low cost, robust design and easy, uncomplicated operation, GALEP soon became one of the most popular mobile device programmers in Europe. Standard equipment for service and mobile programming around 1993 was a laptop computer and a GALEP programmer. While the laptop could run on its own power for a while, GALEP-1 used an external power adapter and thus required access to an AC connector. 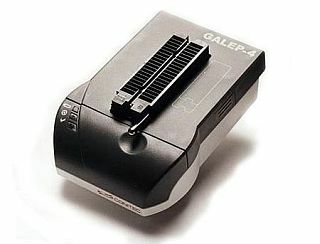 The demand of a really power supply independent device programmer led to the development of GALEP-II. In an even smaller case, GALEP-II contained a compartment for a 9 Volts battery that recharged from the AC adapter and was sufficient to program about 100 chips. This made it the first self-powered device programmer worldwide. 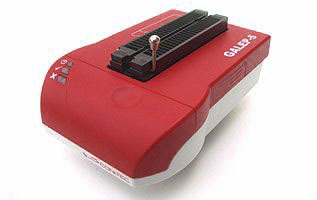 GALEP-II now also supported more programmable devices, such as Flash memory and microcontrollers. The number of programmable devices exploded in the second half of the 1990s and required a new programmer concept. 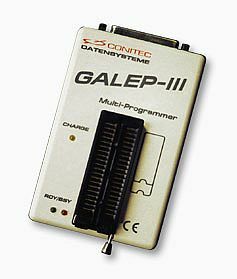 GALEP-III was the first universal programmer of the GALEP series, featuring the concept of universal pin drivers. A pin driver is a circuit that controls a socket pin. The GALEP-III pin drivers provided logic levels, pullup/pulldown resistors, clock, and logical input to all pins of the single DIL-40 programming socket. 8 socket pins were truly universal and also carried ground, supply and programming voltages. Another innovation was the use of a FPGA (user-programmable logic) device for generating clock and output signals and controlling the pin drivers. This concept offered a lot flexibility and speed. 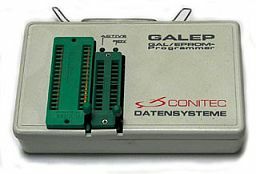 Although the GALEP-III programmer is not in production anymore, thousands of them are still in use today and the software is still maintained. Three tough requirements had to be fulfilled for the next chip programmer generation. It should run longer on battery, it should be faster, and it should support programming voltages on all pins. There was a problem, though. A board with 40 truly universal pin drivers would not fit into the small GALEP case. Should we switch to a bulky case, like all the competitors? The better solution was reducing the board size by higher integration - which meant developing a special driver IC. Conitec's custom designed CDP01 pin driver IC not only solved the case problem, its output signal quality was also far superior to any non-integrated solution. On that occasion, we also developed a more elegant looking case with a huge battery compartment. GALEP-4 was a big success and is, with minor changes, still in production today. The appearance of bigger memory devices requires faster programming algorithms and overcoming the bottleneck of the parallel port interface. USB 2.0 and Ethernet are better means to transfer data to a programmer at high speed. Which also means that we'll need a powerful on-board processor kernel for not directly running into the next bottleneck. Putting an ARM9 LINUX kernel into a device programmer seems to be a little over the top - but it pans out by getting the fastest programming cycles in the industry. Medium and large series production requires a different approach. In a production line, you don't want to put devices manually in a gang programmer; you want the programming process to be as fast, automatic, and invisible as possible. For this we came up with a new lean solution. 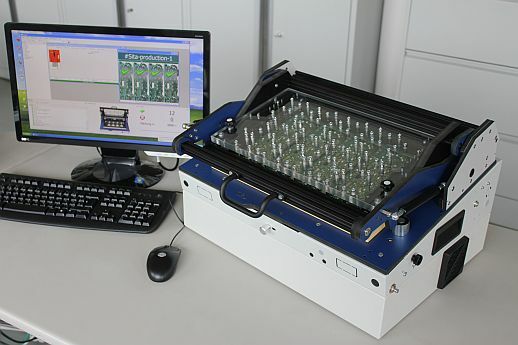 GALEP-5P is an after-placement programming station, equipped with ten GALEP-5 programming modules. It contact boards with needle adapters in a mechanical pressure unit. Up to 1000 boards per hour can be processed. This is a new and revolutionary method for medium series production at a fraction of the cost of traditional chip programming robots.